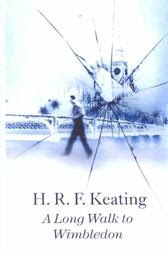 This time we're looking at one of the lesser-known post-apocalyptic novels: indeed, until I updated it, it wasn't even mentioned on the author's Wikipedia page. 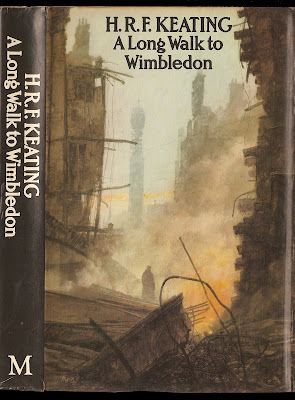 The book is Henry Raymond Fitzwalter Keating's A Long Walk to Wimbledon, and it's an unassuming little bit of bleakness that doesn't try anything incredibly original, but which does what it sets out to do very well. Here's the original hardcover jacket, from my 1978 Macmillan edition. The basic set-up is simple, and best gathered from the extensive dust-jacket blurb shown here--click for a readable version. Of course, post-apocalyptic is used here in one of the more common, yet misleading, ways. In fact, the 'apocalypse' has merely reduced Western society to a level millions of citizens of Africa, Asia and South America would recognise as being very like their daily lives now. The artist for the bleak cover painting is Paul Wright, who I think is this chap, and also cover artist for the Patrick O’Brian novels. It's now out of print again, which is a shame. It's no John Christopher, but it's not bad at all.